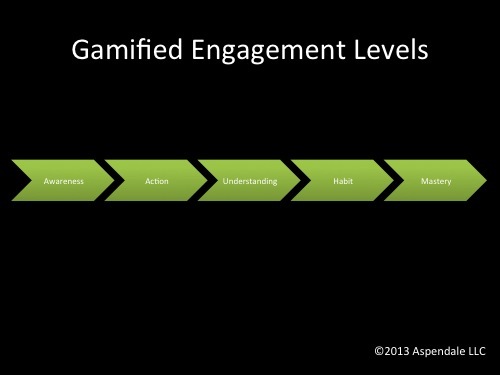 Recently I was asked how gamification fits with other engagement strategies, or whether it replaces them altogether. The answer reveals a major reason why gamification is a game changer. I define gamification as game-inspired tactics to engage people. Traditionally, corporate communication experts have viewed the process of engaging a target audience as a progression from awareness through action. 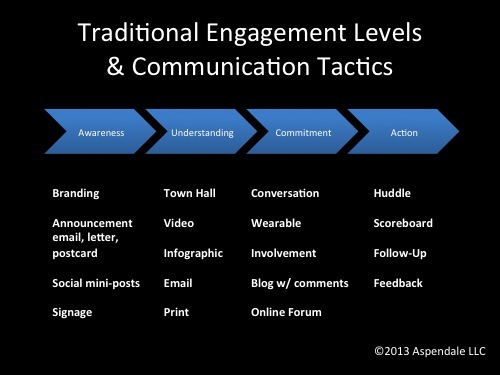 Start with awareness tactics to catch the attention of employees and frame the conversation with the proper context. For example, these tactics might start with a brand identity for the program (to help employees view it is an important endeavor, with high-quality resources provided as a win-win for employees and the company), along with an announcement memo to employees, a postcard to their homes (to help engage their spouses), and posters and other signage. Take action by making healthier food and exercise choices. Some engagement efforts are particularly challenging because success only occurs when the audience’s action becomes a permanent habit. With wellness programs, for example, despite ongoing reinforcement communication and coaching, the long-term participation rate at most companies is low and health-risk factors such as obesity remain high. Well-designed gamification offers the potential to break through that challenge not only as an additional tactic to encourage progression through the engagement levels, but by completely changing the engagement levels themselves. I realized this when Wharton professor Kevin Werbach pointed out what happens when a person plays a video game like Plants vs. Zombies for the first time. She moves right into action. The first level of the game is ridiculously easy, so the player learns how the game works as she plays. There’s no manual or written instructions; the player simply learns by doing, and after she gains an understanding of the basics, the game becomes more challenging. The game continues to become harder and more interesting, and she is motivated to come back to the game on a regular basis, until it becomes a habit. At this point there is an emotional connection similar to the commitment level in the traditional process, but from a behavior-change perspective, she has already advanced far beyond mere commitment. Finally, she levels up to mastery; not only does she continue to play regularly, but she plays so well and knows so much that other players bow down before her awesomeness. If this were a gamified wellness program, she would not only have adopted a healthier lifestyle, she would be evangelizing fellow employees and coaching them to reach the higher levels. 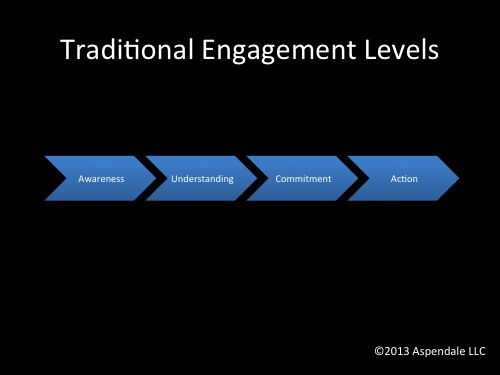 Does Gamification Replace Other Engagement Strategies? That depends on the scope of the program. For a relatively small scope, such as getting employees to complete their expense reports on a timely basis, early data shared by software providers such as Badgeville shows that gamification alone seems to make a significant difference. For a larger scope such as wellness, additional tactics probably increase the percentage of employees who progress to each higher level. And if the scope is quite complex, such as a business transformation or any change that affects the employer-employee relationship, it’s crucial to have a broader strategy that makes a clear, human connection between employees and their leaders about why the change is necessary, where the team is headed, and so on. 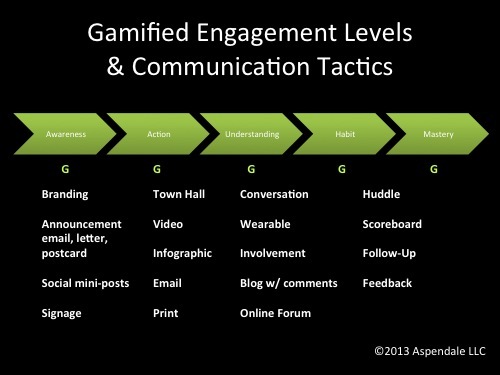 Still, gamification can be useful at every engagement level. For example, if a game is really fun to play, awareness will spread by word of mouth especially if integrated with social media such as Facebook or Yammer. For that reason, rather than tacking gamification on to one of the levels as an additional tactic (in the chart below), it is represented by a big, green G as a tactic to consider at every level.